Product #60827 | SKU 266900 | 0.0 (no ratings yet) Thanks for your rating! Lightweight and compact, clamp-on mattebox for 104mm diameter lenses which can hold three 4x5.65 filters. 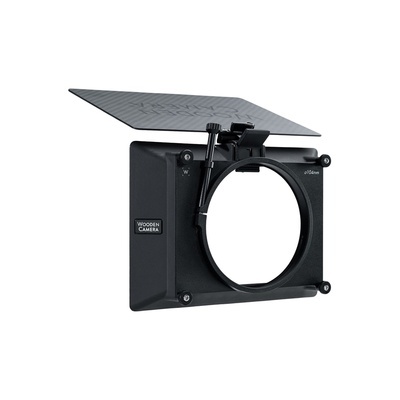 Wooden Camera 104mm Clamp On 4x5.65 Zip Box Pro is a lightweight and compact, clamp-on mattebox for 104mm diameter lenses which can hold three 4x5.65 filters that are loaded from the front and held by a spring loaded latch. The included top flag is made of lightweight carbon fiber and covers the front of the mattebox which is great for protecting the lens between takes. The flag can be removed by loosening the top thumbscrew, aligning the tab with the key slot, and pulling out. Rear opening of this back can be swapped by loosening the 4 thumbscrews and replacing with clamp on backs featuring diameters of 114mm, 110mm, 104mm, 100mm, 95mm, 87mm, and 80mm. If swing away version is desired, the clamp on back can be replaced with the Zip Box Pro 4x5.65 (Swing Away Back Only).